Need help promoting Speak Up to your stakeholders? Speak Up partners – need help promoting the survey to your stakeholders? Check out some of our ideas for inspiration! Don’t forget that Speak Up opens on October 6th until December 19th – participants can register here. q Encourage your stakeholders to participate in Speak Up through email blasts, newsletters, your blog or other online social media tools. q Highlight the Speak Up survey on your website using the Speak Up Partner logo (with a link to the survey). q Inform your stakeholders that you are actively promoting participation in Speak Up by issuing your own “customized” press release using the Speak Up press release template provided by Project Tomorrow. Project Tomorrow will issue its Speak Up national press release on October 6th. q Distribute Speak Up Info flyers during your presentations at conferences or from your booth on the exhibit floor. q Host a “Speak Up” media event to encourage participation in Speak Up. q Use social media networks such as Facebook or Twitter to get the word out about Speak Up to your stakeholders. q Include Speak Up data in your articles, promotional materials or presentations. q Share how the Speak Up results are important to your organization’s mission and work. q Use the Speak Up results to identify your stakeholders’ needs, secure funding or demonstrate the success of your initiatives. q Schedule Julie Evans, CEO- Project Tomorrow, to present the Speak Up findings to your team, at a conference or through a webinar. q Host a regional or state summit to share Speak Up data and develop an action plan for creating 21stcentury schools. q Blog about how you are using Speak Up data to inform your decisions about curriculum or technology, programming, legislation, or services. q Share promising practices with staff from partnering organizations, schools and districts who are involved with Speak Up. This entry was posted in Promotional ideas, social media, Speak Up, speak up 2014, Speak Up partner on September 8, 2014 by project_tomorrow. Help spread the word about Speak Up with our sample tweets! To Speak Up, simply visit our official Speak Up 2014 page in order to register your district. Be sure to mark your calendars for our launch date, October 6th – you can do so with our invite here! Furthermore, check out our promotional materials page for tools to use to get your district on board and ready for Speak Up. Follow us on Twitter and Facebook to stay up to date on all things Speak Up! This entry was posted in Facebook, outreach, Promotional ideas, social media, Speak Up, speak up 2014, Twitter on August 25, 2014 by project_tomorrow. Speak Up 2013 | There’s only two weeks left to participate. Surveys close next Friday, December 20th! Thank you to all the participants that have already taken part in the Speak Up surveys! Since the launch of the survey over 240,000 Students, Educators, Parents and Community Members have shared their ideas about the use of technology in education. Be sure to take the survey today and pass along to your network of friends and family, remember the survey is open to ANYONE interested in sharing their thoughts on critical 21st century education and technology issues. Last minute Promotional Ideas There’s still plenty of time to get involved in Speak Up, find new ideas here. New to Speak Up, watch our 45 minute introductory webinar! Learn how you too could get a free webinar with CEO Julie Evans next school year! Help us reach 1,500 community member surveys! You don’t have to be an educator or student to take the survey. The voices of your community members are important too! Happy Reading! Feel free to share your thoughts with us on Facebook, Twitter and our Blog. 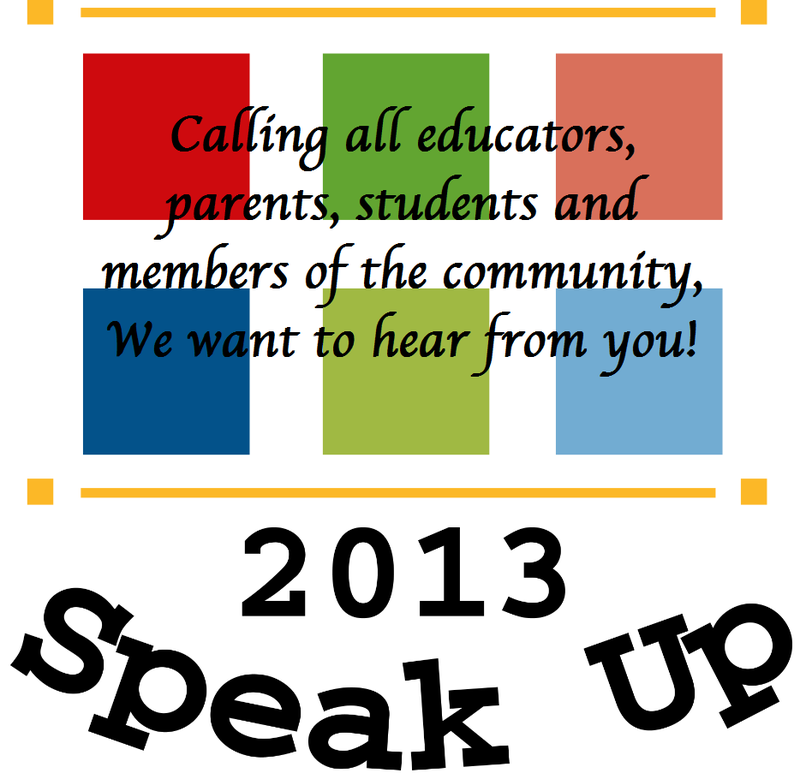 Speak Up 2013, be sure to get your survey in by 12/20! Together, let’s work towards leveraging technology to promote enhanced learning in our K-12 schools! Thank you to all our participating schools, districts, followers and to all our partners for your encouragement and support of this year’s surveys! Without you Speak Up would not be possible! Host a Speak Up Day: Pick a day in December to have your K-12 community complete the Speak Up Surveys! San Marcos Unified School District in California collected 1,500 surveys during their 1st Annual Speak Up Day during the Speak Up 2012 survey period. SMUSD promoted their event via email, website, phone calls & social media! Post a notice to your local community newspaper or blog: Post a message inviting your community to participate in Speak Up to your local newspaper or patch.com! Barrington Schools in RI and San Bruno Park School District in CA posted to their local patch.com, check it out! For sample text, please contact the Speak Up Team at speakup@tomorrow.org or use one of the follow sample texts found on our promotional materials page. Focus on one survey type: Each survey receives their own data set with national comparisons (k-2, 3-5, 6-8,9-12, parent, teacher etc.) a focus on teachers, parents and/or administrators is an easy push and a great way to receive a meaningful dataset. Some recommendations would be to send an email or phone recording to parents or email blast to your teachers. Click here for a variety of sample emails. Highlight the Speak Up survey on your website using one of our Speak Up logos (with a link to the survey). Click here for the code to embed on your website. Make sure to include your survey password! Do your teachers need an activity before the winter break? Or an idea for sub plans? Download one of our Speak Up Lesson Plans, created by our ownMeredith Kohl, who holds a Master of Education in curriculum and instruction and a previous elementary teacher. Lesson Plans for K-2, 3-5 and 6-12 are available for download. * Group survey options are available for K-2 students. Use social media networks such as facebook or twitter to get the word out about Speak Up to your stakeholders. Try retweeting one of our @speakuped tweets or searching #speakupsurveys. For additional promotional material to spread awareness, please visit our promotional material page at: http://www.tomorrow.org/speakup/promo.html. Not part of a school or district- help get the word out with our Partner Promotional Material Tools. If your organization is interested in partnering with Project Tomorrow this year to assist with outreach to your contacts, please contact Jenny Hostert at jhostert@tomorrow.org. For a list of Speak Up partners and sponsors please visit our website. Interested in participating in this year’s Speak Up surveys but want to learn more about it? Now’s your chance! Watch our Speak Up Introductory webinar recording hosted by our CEO, Julie Evans. This 45 minute recorded webinar includes background information on Speak Up, benefits of participation, key Speak Up findings from last year’s survey as well as how their school can participate in Speak Up this year. The recorded webinar can be accessed via Blackboard Collaborate here:Speak Up 2013 Planning. As a special incentive for participation this year, all districts with surveys from at least 25% of their student population will receive a free webinar with Julie Evans, CEO of Project Tomorrow using your specific district and state data results in spring or fall 2014. Contact Jenny Hostert on the Project Tomorrow Team for additional information: jhostert@tomorrow.org. This year, for the first time, we are providing a special online survey for community members. Local employers, after school providers, school board members, homeowners without children in the local schools or anyone with an interest in promoting better learning in our schools can now provide their views on the role of technology in preparing students for the jobs and careers of the 21st century. This new set of data will provide valuable insights for schools and districts as well as state and federal policymakers on the importance of digital tools and resources for college and career readiness. All community members will access the survey through a school in their local community. Look up a school via zip or state and school name. Surveys will take about 15 minutes to complete. Students will be required to enter in a survey password “secret word”. Educators, parents and community members are not required to enter in a survey password. This entry was posted in Promotional ideas, Speak Up 2013, Speak Up News, Speak Up webinar on December 10, 2013 by Project Tomorrow. There’s Still Time to Get Involved with Speak Up! Survey open through Dec. 20th! Participate in Speak Up and share your ideas about how to leverage technology in schools to promote better learning: bit.ly/SU13survey>>> Tweet this! Our district has registered to be a part of a nationwide conversation about educational technology–join in today: bit.ly/SU13survey >>>Tweet this! Teachers, now is the time to encourage your students to voice their opinions on the use of technology in school! http://bit.ly/SU13survey >>> Tweet This! Let’s be a part of the thousands around the country who are speaking up to decision-makers about 21st century learning: bit.ly/SU13survey >>> Tweet this! Calling all Parents,contribute to the national dialog about science, technology & preparing students for the 21st century workforce #Speakup >>> Tweet this! Share your opinions about the role of technology in education, open 10/2-12/20, 2013 at http://bit.ly/SU13survey @speakuped >>>Tweet This! New Speak Up survey for community members! Please be sure to share with your network of friends-every voice counts! http://ow.ly/pKhxG >>> Tweet this! To get your district involved or for more information, please contact Jenny Hostert at jhostert@tomorrow.org. This entry was posted in Promotional ideas, Speak Up, Speak Up 2013 on December 5, 2013 by Project Tomorrow.